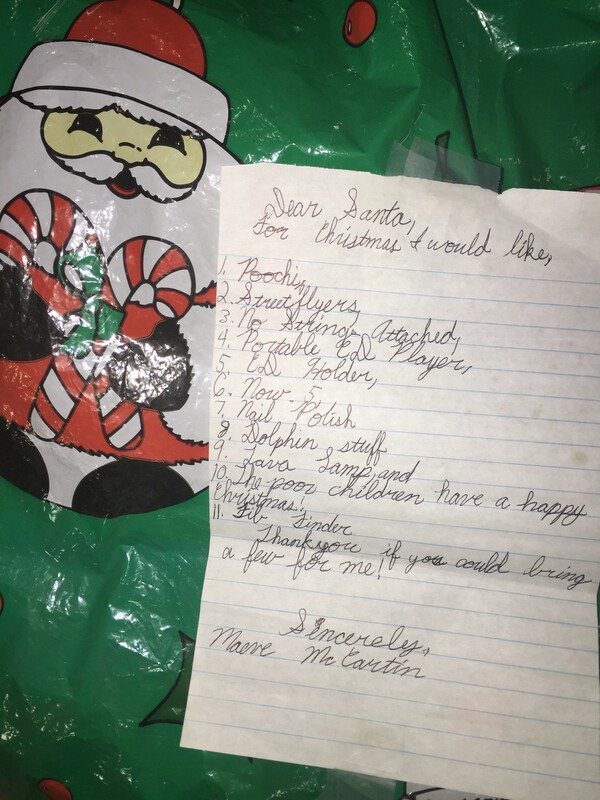 The VP of Sales at Lifespan Brands, Pat McCartin, found this adorable letter to Santa written by his daughter, Maeve, when she was about 10 years old (She is now an adult, and will surely love seeing this old letter!). Note number 9 – she asked for a Lava® lamp. Too bad her dad didn’t work for Lava Lite way back then. But I’m sure that Maeve got her Lava® lamp from Santa! Also very sweet in Maeve’s letter is number 10, she wished that “The poor children have a happy Christmas!” So cute and thoughtful for a 10-year-old! Maeve’s letter to Santa made us wonder, did other kids ask Santa to bring them Lava® lamps? We were happy to find all of these letters online and wanted to share them. We hope that Santa brought all of these kids the Lava® lamps they wished for! And also agree with Maeve’s wish above, that ALL kids (and parents) have a happy Christmas! Please bring me a new bike and Pokemon cards. I would also like a lava lamp. If it’s not too mush trouble, I would like some Legos. I love you!! What is your frabrit color? New elf pet, new elf on the shelf, lava lamp, Santa stuffed animal, elf on the shelf stuffed animal. Dear Santa, I hope you are well. If you are able to bring me a surprise and a lava lamp. That is all – thanks Santa. Goodbye – oh and tell Rudolph and the elves that I said Hi. How are you doing? Do your raindeer like carrots? By the way, how is Mrs. Clause doing? Are your elfs working harde? Well, anyway all I want for x-mass is this really cool lava lamp that has purple meatal and pink lava lik wed and purple lava in it to. Some more webkinz like maby two or three. And the webkinz that I really want is the kawala and the fire dragon. And by the way I will make homemade cookies just for you and I will leave some carrots for the rainder. I would like a Intendo DS and a lava lamp. I deserve these items because I’m a very good friend. I would like to know how you deliver all the toys in one night? Hi! How are all of your reindeer and Mrs. Claus? For Christmas this year I want a microscope, a telescope, a Barbie lip gloss maker and last but not least I want a lava lamp. My sister, Mallory Lesley, 5, wants a Barbie shop with me cash register, a Barbie rock n’ roll house, a bean bag, and last but not least for her a Kit American Girl Doll. Thank you for the presents you gave me last year. I would like a wii. I would like a playstation 3, dsi, xbox 360 and a lava lamp. The year I turnded six, Jazz got a lava lamp for Christmas. It transfixed us both from the second she plugged it in, with globs of oily crimson that rose and fell like sleepy dancers in a pool of green. That’s how “Silent Night” looks! I’d said, excited to share what I saw every time I heard the song. I grabbed the lamp, but it slid out of my hands and broke, spilling all those little dancers onto the kitchen floor. When my parent walked into the room seconds later to find Jazz boring holes into my skull with her eyes like some medieval torturer, Papa covered one of his own eyes to remind us that there were two ways to look at everything. It’s not the end of the world, Mama said. Maybe Santa will bring you an even better lava lamp next Christmas.